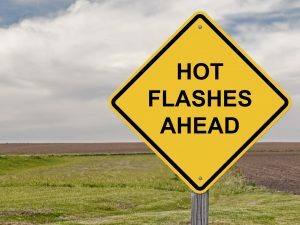 Could Obesity Increase Your Risk For Hot Flashes? As you get older, it can be harder to lose weight due to loss of lean muscle mass. 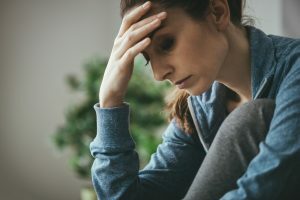 In women, aging can also bring menopausal symptoms such as hot flashes, anxiety, dry skin, mood swings, as well as weight gain. Recent research shows that there may be a link to being obese and having intense hot flashes. A study in the journal Menopause looked at 750 Brazilian women between 45 and 60 years old. Obese women had more intense hot flashes that impacted daily living and work performance than those non-obese women. It is suggested that body fat acts as insulation, which traps heat in the body. Joint pain, muscle pain, and urinary issues can also greatly impact obese women. This can be due to the extra pressure that excess body fat has on the bones, muscles, and organs. It is suggested that maintaining a healthy body weight can help improve quality of life in women as they age. Losing weight and staying within a healthy range is not easy. However, follow these tips to help get to and keep a healthy weight for life. Consume a healthy balanced diet by limiting processed and convenience foods. Processed and convenience foods contain more sugar, fat, and sodium than their whole food counterparts. Instead, focus more on consuming lean proteins, fiber-rich fruits and veggies, whole grains, and low-fat dairy products. Stay active most days of the week. Exercise such as walking, gardening, dancing, biking, or stair-climbing can all benefit health. At least 30 minutes of exercise for most days of the week can help heart health and weight management. See a doctor on a regular basis. When you are overweight, going to the doctor can be a scary thing. The doctor’s office may be a place where such people have been told to lose weight without getting to voice other health concerns. However, it is still very important to visit a healthcare provider at least once a year. Early detection of health problems can prevent chronic disease. Visit the doctor more often if you already have chronic health issues such as heart disease or diabetes. Have vitamin levels checked. Recent research is finding there may be a link between vitamin D deficiency and the risk of overweight or obesity in children. Also, a 2013 study found a link between vitamin B12 deficiency and being overweight or obese. This research shows the importance of checking for vitamin levels to prevent health issues. Therefore, ask your doctor to have these extra labs checked each year. Have thyroid and hormone levels checked. Thyroid disorders and hormone imbalances can cause weight gain and make it hard to manage weight. Medication can help with treatment of such conditions if diagnosed. Therefore, ask your doctor to test for your levels if weight gain is difficult even with diet and exercise. Take supplements such as Estrosa by Vita Sciences. This supplement contains natural black cohosh and the antioxidant resveratrol. Estrosa can help reduce hot flashes, bloating, weight gain and mood swings. Abraham, S.B, et al (January 2013) “Cortisol, obesity, and the metabolic syndrome: A cross-sectional study of obese subjects and review of the literature” Obesity, 21(1): E105-E117. Baltaci, D., et al. (August 2013). “Association of vitamin B12 with obesity, overweight, insulin resistance and metabolic syndrome, and body fat composition; primary care-based study.” Medicinski glasnik, 10(2):203-10. Wakayo, T., et al. (April 2016) “Vitamin D Deficiency is Associated with Overweight and/or Obesity among Schoolchildren in Central Ethiopia: A Cross-Sectional Study” Nutrients, 8(4): 190.